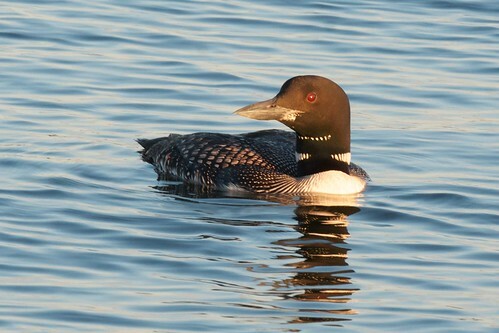 Tales of a Minnesota Geek » Blog Archive » Photo of the Week – Loons! Photo of the Week – Loons! Beacon Shores – Aug 2012 – Loons, Loons, Loons!, originally uploaded by pmarkham. When we traveled to Beacon Shores Resort on Whitefish Lake this summer, one of the things we saw a lot of was loons — the Common Loon to be exact. Loons are normally relatively solitary birds and very territorial. They will pair off and then aggressively defend their territory free of other loons during their mating season. I was surprised that for this visit to Whitefish Lake, we saw HUNDREDS of loons. They were doing something I’ve never seen loons do — flocking. As we inched closer to the flock and I snapped photo after photo, I realized something. Most of the birds we were looking at were juvenile loons. You can tell from their markings. The juveniles have flecks of grey on their heads instead of the solid deep green that an adult loon would have. After doing some research on the subject, loons will apparently flock when they are preparing to migrate. It was a beautiful site. This photo is one of the many loons we saw during that week. It was taken during the “Golden Hour” of late evening sun.